That crackle finish on candles you see in stores, is easy to replicate on your homemade candles. 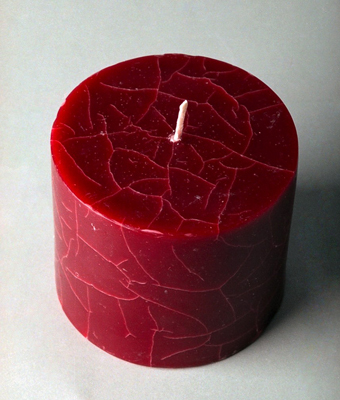 Add a crackle finish to create some visual interest on an otherwise plain candle. Your homemade Christmas gift will have a bit of extra dimension. Create cracks in your candle by overdipping and freezing it several times. Freeze your finished candle for two hours. Sometimes, freezing can fracture your candle all the way through, so keep an eye on your candle during this time. Melt wax in the top part of a double-boiler. Dip your candle into the can, slowly and steadily. You can hold your candle by the wick with either your fingers or a tool, such as pliers. Dip your candle into cold water. This last step helps ensure that you get a nice, shiny finish. Repeat Step 2 one to two more times, until your candle is completely covered. Place your dipped candle on wax paper and return it to the freezer for an additional two hours. If you want fewer cracks, leave your candle in less time; if you want more cracks, leave it in the freezer longer. When the candle reaches room temperature, find and push out any air bubbles that you see on the candle’s surface.